VectorLAB at Chris O’Brien Lifehouse is the place where Medicine, Physics, Biology and Chemistry researchers come together to solve some of the most urgent problems in Cancer. The cancer research team was formed over a decade ago when Professor David McKenzie from The University of Sydney and A/Prof Natalka Suchowerska from Chris O’Brien Lifehouse recognised their common interest in translating advances in science and technology to the practice of medicine. This collaboration was nurtured by Professor Michael Jackson, a radiation oncologist with the vision to translate science to the clinic. Anna Ralston joined the team, bringing medical physics expertise to help bring discoveries into practice. Linda Rogers manages the cell biology facility at Lifehouse, enabling ideas to be tested before animal and clinical studies are initiated. Dr Paul Liu, postdoctoral fellow, is engaged in most of the projects, facilitating experimental design and developing mathematical analysis. The diverse nature of VectorLAB means that leading specialist scientists and clinicians are brought onto projects to form the most effective team to address the problem. For the past two years, VectorLAB has collaborated with A/Prof Brian Hawkett from the School of Chemistry and Dr Wojciech Chrzanowski from the Faculty of Pharmacy to develop drug delivery systems related to cancer. Dr Markus Muellner, a polymer chemist in the school of Chemistry at the University of Sydney, has recently joined the team. Dr Guy Lyons has a long standing collaboration with VectorLAB around cell and animal radiobiology, radio-resistance and radio-sensitization. The international collaborations of VectorLAB include A. Prof Charles Kirkby, (Canada), Giovanni Reggiorri (Italy), Dr. David Menichelli (Germany) and Ms. Laura Toussaint (France). Read about exciting new research by VectorLAB physicians on ABC News. A/Prof Natalka Suchowerska and Professor David McKenzie have developed a technique for the delivery of radiation therapy that involves the ‘bystander effect.’ The result of using this technique would be the same effect on the tumour for half the dose of radiation. Nanoparticles are being used to efficiently carry drugs to the target site in the body. VectorLAB is developing ways in which nanoparticles can combine radiation and chemotherapy for a bigger therapeutic effect. The benefit to the patient is a better outcome for a reduced dose. University of Sydney researcher Prof David McKenzie says: “there are many types of nanoparticles. We aim to use a gold heart in a nanoparticle coated with chemotherapy drugs to increase the therapy dose to the target area to drive synergies”. Most cancer patients receive some form of chemotherapy as part of their treatment. The side effects can significantly compromise the patient’s quality of life and limit the amount of treatment that can be given. By creating synergies between therapies, we can give a lower dose of each for the same or greater effect. This will be better for the patient and more cost effective. Not all breast cancers are the same. In recent years experts have classified breast cancers according to their aggressiveness and molecular profile. Currently however all breast cancer patients are prescribed the same radiotherapy regimen, regardless of cancer subtype. Treatments for two subtypes urgently need to be reviewed: Herceptin positive and triple negative. When Her 2 positive patients are on Herceptin, they appear to become more sensitive to radiation. Current practice is to stop treatment when the reaction becomes too severe. We need to change the radiation treatment regimen to customise it for this breast cancer subtype. Although the commercial sector release drugs, it is common to find that they have poorly considered the effects of common therapies being used in conjunction with each other, if at all. The typical response to an enquiry is: “…concurrent radiation: no information” [Pertuzumab, British Columbia Cancer Agency Drug Manual, 2014]. Triple negative breast cancer patients however exhibit a range of sensitivities to radiation and may benefit from radiation schedules customized to the individual. Dr Susan Carroll says “triple negative patients tend to be our younger breast cancer patients and we really want them to do well, because they have a lot of living ahead of them…”. By moving away from daily small doses of radiation we anticipate a better outcome. This project is important because breast cancer is the single most common cancer in women, affecting all ages. 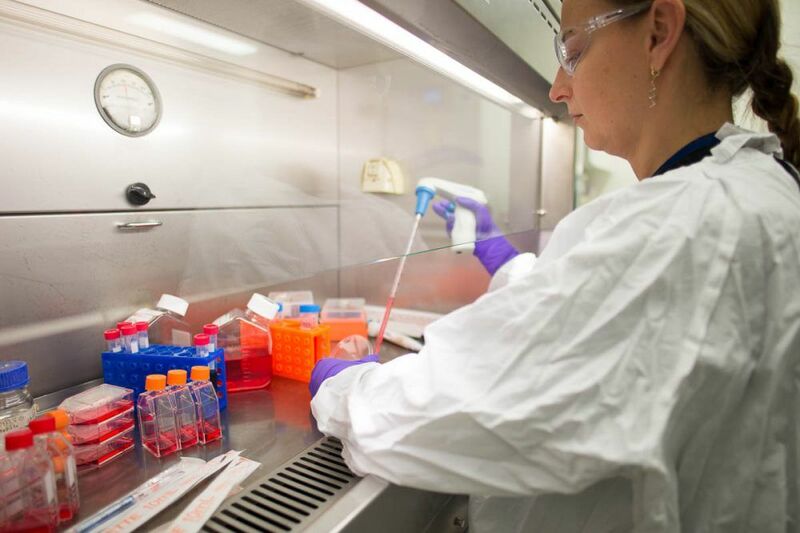 Some breast cancer subtypes are still evading our best treatment efforts. This research focusses on customizing radiation treatments for these patients. Our approach has been adopted by other clinics around the world and is changing clinical practice in brachytherapy and small field treatments. VectorLAB has embarked on an ambitious project that aims to print bones for cancer patients using a 3D printer. 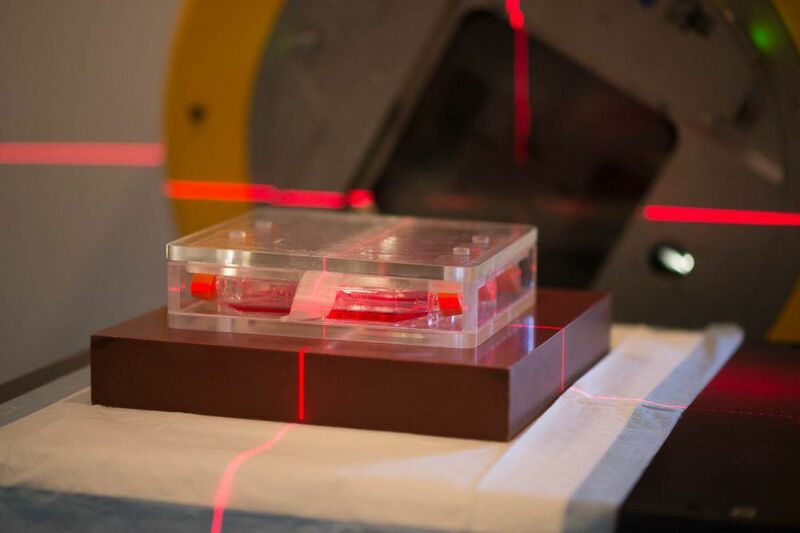 The team combines expertise in 3D printing, materials physics, cancer surgery and cell biology. Chris O’Brien Lifehouse researcher Natalka Suchowerska says: “Initially we aim to demonstrate 3D printed bone replacement parts, which we will subsequently functionalize using technology developed in the School of Physics for binding proteins to polymer surfaces. Paul Liu from VectorLAB has been practicing using a simple 3D printer worth about $1500 to print a baby’s ear that fits together in three parts. This was done to provide a copy for a surgeon who used it to model a new ear using the cartilage of the baby born without an ear. Over 60% of cancer patients have surgery as part of their treatment. Some of these have parts of their bone removed, which need to be grafted from other parts of their body. The need for the donor graft site to heal imposes an additional burden on the patient. We propose to develop 3D printing technology to recreate the original bone removed in surgery without the need for a donor graft. This process occurs in 2 stages. 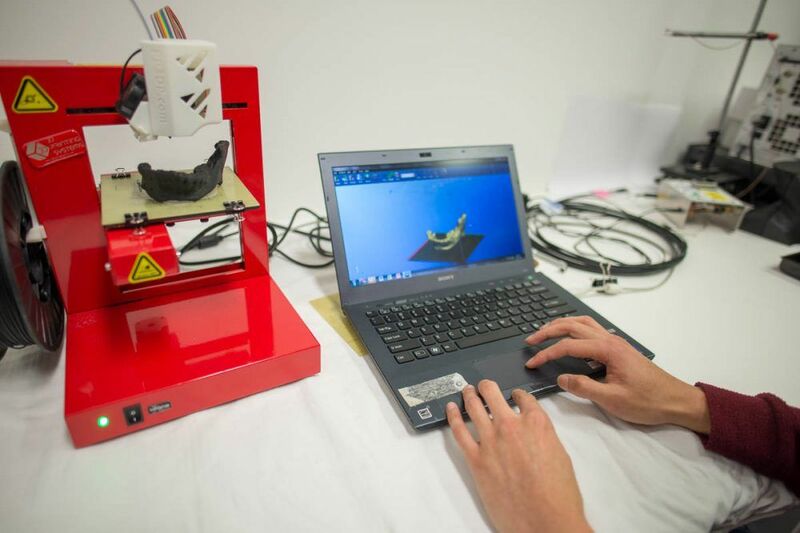 The first stage is to 3D print a replacement bone that is an exact match to the excised bone. The second stage is to functionalize the surface of the printed bone replacement scaffold to attract the patient’s existing bone cells and allow then to reform a fully functional bone. The successful outcome of this project will remove the burden of a bone graft, improving the patient’s wellbeing and speed of recovery. It will reduce the overall surgery time. The functionalized bone replacement will accelerate the integration of the bone graft into the patient’s skeleton. In patients with insufficient or unsuitable donor material, this technology may offer the only solution. The team is sourcing a stereolithography additive printer [3D printer] with high resolution capabilities, an example of which can be found at http://formlabs.com/products/form-1-plus/. 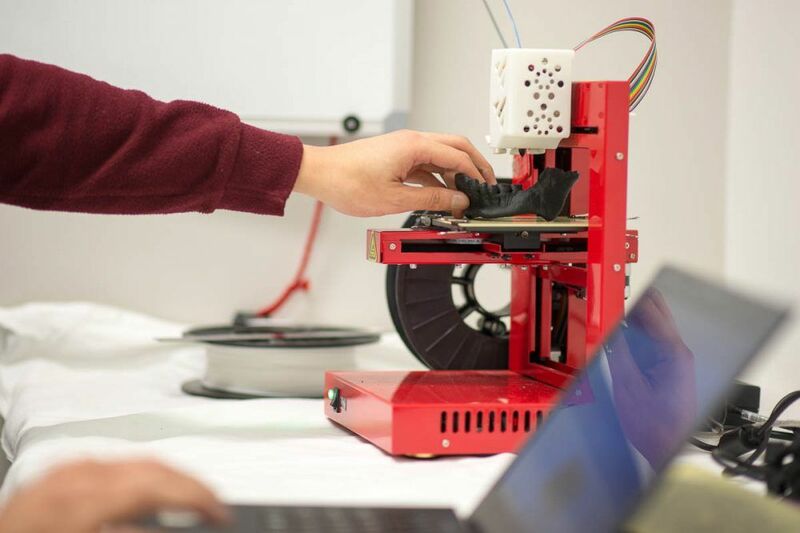 This printer is superior as it can print full solid models by using a lastic extrusion printers, with which we have extensive experience, are limited as they leave void space and have lower resolution. In the early stage of the project, the focus will be on the development of the technology, followed by clinical evaluation and translation. The team was awarded competitive funding in 2014 through the Pilot and Seed Fund of Sydney Catalyst to progress this project ready for the ARC Discovery program. 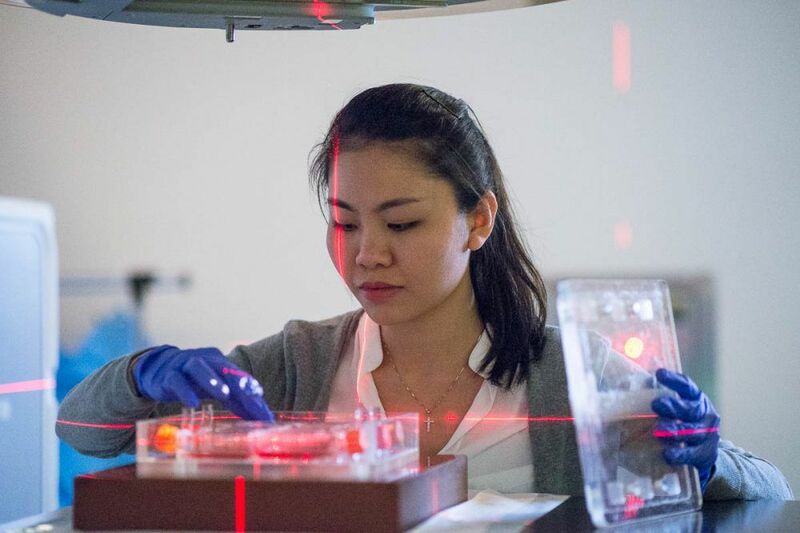 Valery Yihui Peng is researching how the advantages of high intensity microbeams as implemented on a synchrotron can be translated to the clinic using modern linac MLC collimators that are capable of similar “striped” irradiations but on a larger scale. Measures of the dose deposited as well as cancer cell survival will be used. VectorLAB have developed technology to use light as a measure of radiation. This enables the radiation to be measured in real-time and inside the patient as the treatment is being delivered. The measurement of dose from very small radiation fields that are a challenge to most commercial detectors have been used as a standard by which other detectors are benchmarked. The use of light rather than electronics to measure radiation dose uniquely enables this detector to be used in magnetic fields such as those around an MRI-linac. The expertise of VectorLAB in this field has now been directed towards measuring the dose enhancement achieved by nanotechnology in the form of small gold particles. We have opportunities for students in science, medicine and engineering to join our team and undertake activities in all of the above areas.